303® Aerospace Protectant™ is a non greasy protectant that can be used on automotive leather, door and trunk seals, convertible tops, engine parts, Plexiglas, tires, headlights, dashboards, plastic fenders, tonneau covers, car bras and more. 303 Aerospace Protectant dries to a clear matte finish without a trace of oil and because it is water-based, this protectant is safe to use on almost all products on the interior or exterior of your vehicle. 303 will protect against fading, discoloration and cracking from harmful UV rays while also repelling dust and stains as well. Simply spray on and wipe dry. Each application will last for months. Keep UV sensitive materials looking like brand new for several years. 303 Aerospace Protectant contains no petroleum distillates, alcohol, mineral oil or harmful silicone oils. Use only on clean surfaces. For best results use 303® Multi-Surface Cleaner™. Place a drop cloth under the cleaner to be treated to catch any overspray. 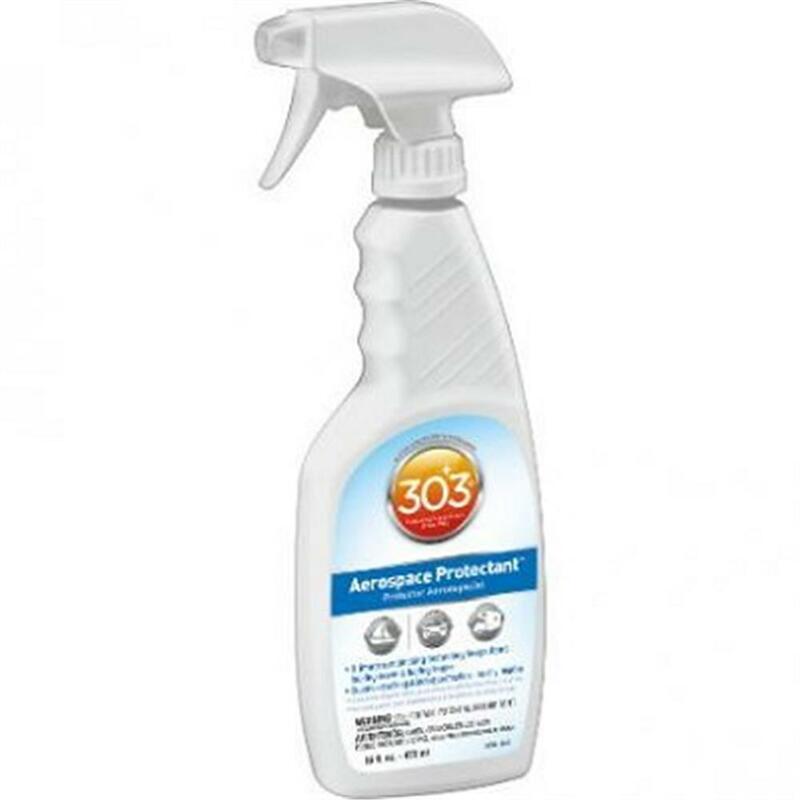 Out of direct sun, spray surface with 303® Aerospace Protectant™ and WIPE COMPLETELY DRY. If streaking occurs, too much product has been used. Use a wet towel to remove excess, IMMEDIATELY WIPE COMPLETELY DRY. Note: this product does not air dry. Extra buffing with a dry cloth INCREASES bonding, repellency & longevity. Apply every 3-5 weeks for maximum UV protection. Great for use on a variety of surfaces such as: vinyl, leather, plastics, synthetic & natural rubber, eisenglass, PVC, teak, gel coat & fiberglass. Ideal for: Hypalon inflatable boats, wet/dry suits, tires, side-out seals, RV EDPM rubber roofing (for your safety, never walk on a wet roof), helmets, visors, and goggles. Not for use on unfinished leathers (such as suede), fabrics (canvas) or floorings.